Throughout its amazing history, Planet Earth has kept on changing. This book follows its astonishing transformation from a tiny blob of stardust to a planet teeming with life. Covers the entire history of Planet Earth from the Big Bang to the present day, including how life began and evolved, the age of dinosaurs and the takeover of mammals, and how the planet is changing in the modern world. This fascinating story is brought to life with stunning full-colour photographs, vibrant illustrations, fact boxes and diagrams, as well as a timeline and full glossary, contents page and index. 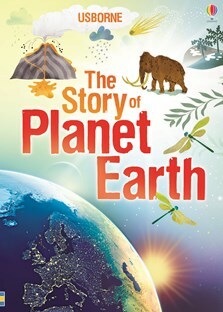 Includes links to recommended websites with video clips, animations and more information about the story of the Earth. An exciting look at the history of the world, from the Big Bang to the present day. The attractive presentation and highly readable nature of the book (the text flows almost like a story) make this a great read for anyone interested in the wonders of our planet.